You can replace a BE23 with the equivalent up-grade BE46 or you can install a Be124 controller. The Be124 features removable plugs for all connections. 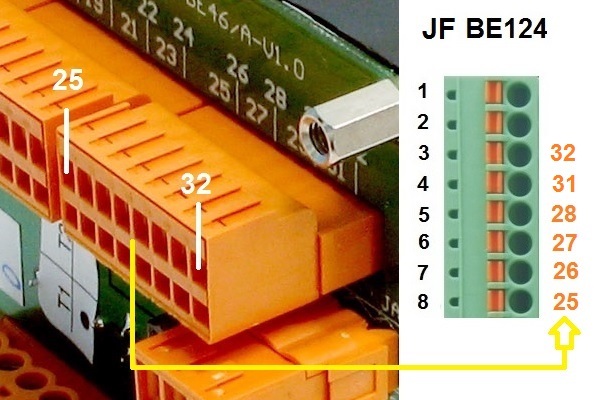 A connector for digital input & analog inputs (10 poles, pitch 3,81mm) is provided for the connections of switches and sensors. An 8 poles removable connector (pitch 3.81mm) allows you to connect the relays that interface with the engine. Power supply from battery is connected via 0,8x6,3mm blade terminals. You can see the connectors (pitch 3.81mm) for the serial interface and CANbus as well. The Input/Output connections are made via PUSH-IN spring connection system. Voltage & Current connections are made via Plug component (the pitch is 7,5 mm for Voltage & 5.00mm for Current ) with screw connection method. Next section describe how to connect each wire previously connected to the BE23. Blade terminals 15/54 & 50 should not be used in replacing a BE24 or Be46 genset controller. 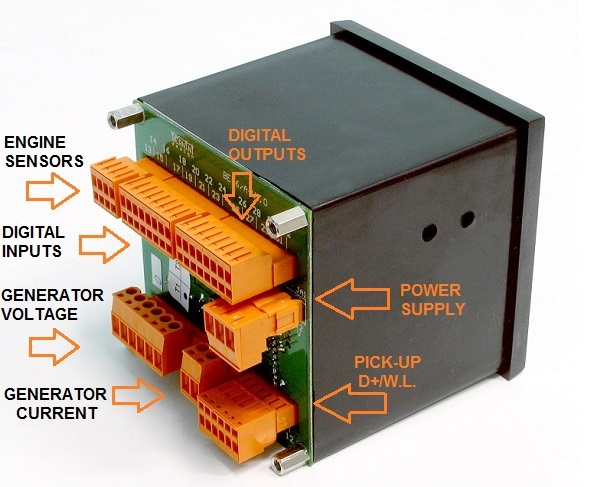 You can use the serial interface in case you want to upgrade your generator for remote control & monitoring. The Be23 features removable plugs as well. Before commencing cables removal, we recommend that you take a picture by using your mobile phone or by using a camera. This will help you in case you are no longer able to find the original cable position especially if you do not have the wiring diagram of the control panel. Not all connections are normally used. We recommend that you remove the battery and battery charger. Make sure that there is no power utility voltage wires or connections to the mains in the control panel. In this case you have to remove all sources of voltage. Do not commence the modification if you do not have appropriate technical background. Unplug the connector, remove the Be23 controller. Install the Be124 controller. It features the same dimensions. You are not required to modify the size of the original 'cut-out'. 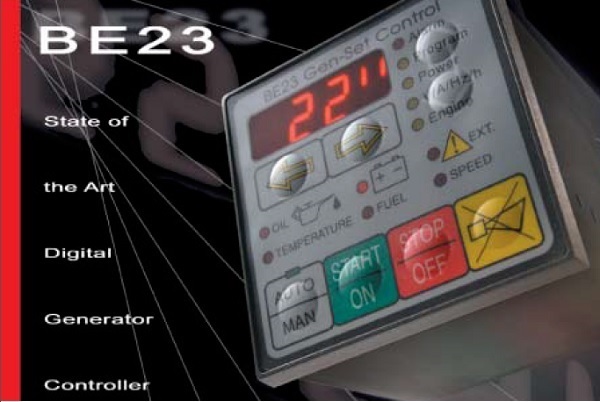 The Be23 interfaces with analog sensors of Oil pressure and Engine Temperature. If no wires are connected on these terminals, skip this section. 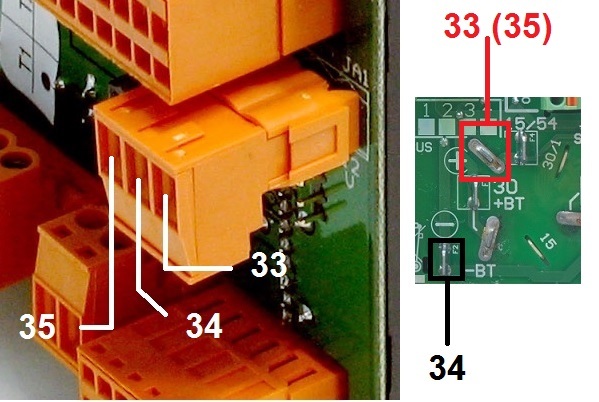 If you have wires connected to terminals 13-14-15-16, you are required to follow the connections indicated on the left. Terminal '13' or '15' must be connected to terminal 'JC4' for 'Ground Error Voltage Compensation'. Terminal '14' (Oil Pressure Sensor input) must be connected to terminal 'JC7'. 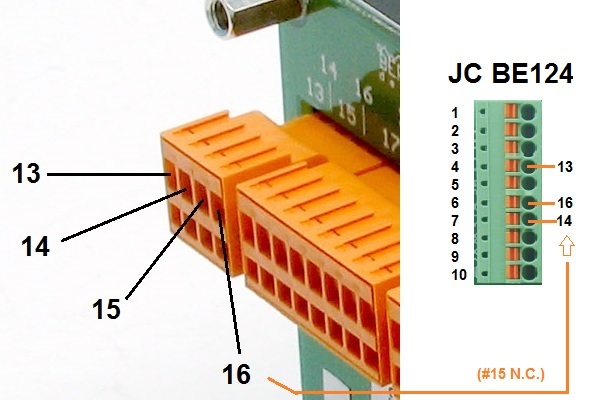 The terminal '16' (Temperature Sensor input) must be connected to terminal 'JC6'. To make a connection, simply press the orange actuation lever with a small screwdriver. In this way you open the contact. Make sure to remove at least 5mm of insulator. Insert the wire and release the actuation lever. About Terminals '13' & '15'. These terminals are internally connected inside the Be23 controller. Normally, one wire only should be connected. Sometimes, you may find both terminals connected. 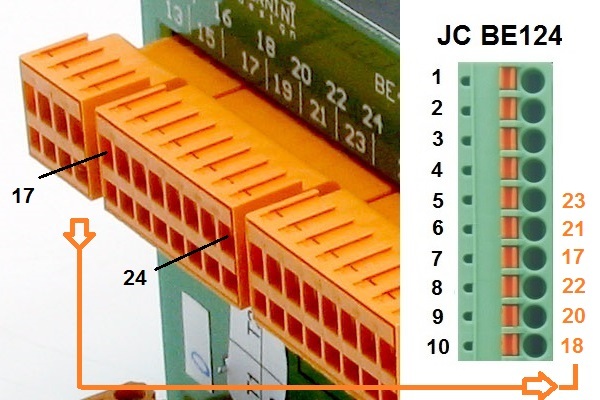 In this case it is enough to connect one of the two wires ('13' or '15') to terminal JC4. You can cut the 'not used' extra piece of wire. NOTE: YOU WILL BE REQUIRED, AFTER COMPLETING THE FULL WIRING, TO PROGRAM ALARM SETTINGS FOR TEMPERATURE AND OIL PRESSURE (see section 11.4.09-10-11 of the installation manual). Terminal '17' is the Oil Pressure Switch connection; must be connected to JC7 (if already used for analog sensor, contact us for support). Terminal '18' is the 'Emergency Stop Input': must be connected to JC10. Factory programming features a N.O. contact. You can set N.C.: see section 11.8 of the installation manual. Terminal '20' is the 'Remote Start Input' (it starts the engine only); must be wired to JC9. Terminal '22' is the 'Remote Generator Input' (it starts the engine & transfer the load to generator); must be wired to JC8. Terminal '23' is connected to an analog 'Fuel Level Transducer'; must be wired to JC5. You are required, after finishing the complete wiring to set up alarms about fuel level as indicated in section 11.6 of the installation manual. If the Be23 has a wire connected to terminal '19', there is an additional FUEL LEVEL SWITCH in the fuel tank. In this case contact us for support . If there is only a wire on terminal '19' (there is no connection on terminal '23', it means that there is only a FUEL LEVEL SWITCH. In this case, connect the wire to terminal JC5. The Be124 will automatically treat this input in digital mode. Terminal '25' is the Fuel Solenoid (Energized to run) output connection; must be connected to JF8. Terminal '26' is the Starter Motor (it drives the pilot relay) output connection; must be connected to JF7. Terminal '27' is the Sound Alarm (horn) output connection; must be connected to JF6. Terminal '28' is the Generator Circuit Breaker (GCB) output connection; must be connected to JF5. Terminal '31' is the ' Energized to Stop Solenoid' output; you have to connect to terminal JF4. You are required to set the option  for the ‘output 1’ (see table 11.9). See section 11.4.7 to setup a time for this function. Terminal '32' is the programmable Output 'Preglow'; you have to connect to terminal JF3. 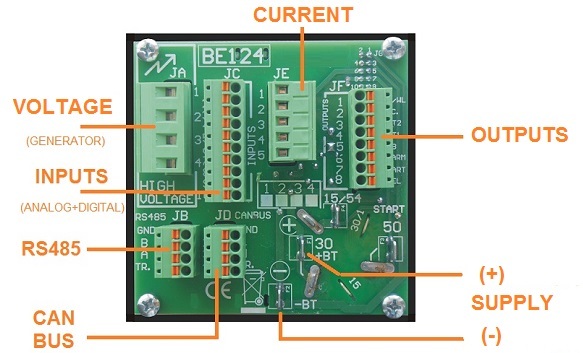 You are required to connect a driver relay for preglow. See section 11.4.5 for programming. In case terminals '31' & '32' are not connected you may find wires connected to terminals '29' and '30'. Terminal '29' is the programmable Output '1'; you have to connect to terminal JF4. Terminal '30' is the programmable Output '2'; you have to connect to terminal JF3. You have to program the output options according to your need. See section 11.9 of the instructions manual. The connections require the use of 'female blade' terminals 0.8x6,3mm. You can find them as spare parts in the Be124 original box. You are requested to use proper tooling for connection the terminals. You may find information about 'FASTON' on this link. Before commencing the connection of the wires we recommend that you disconnect the battery and battery charger. Do not connect the blade terminal 15/54. The Be23 has different point of connection for 12V and 24V battery. In other words, you can find a wire connected to terminal '33' or '35'. This does not matter in case you use a BE124. It works on 12V or 24V. For this reason you have only one ('30+BT') blade terminal for the battery plus. After connecting the 'battery plus, you are required to connect the battery minus to terminal -BT. In case you are doing a general modification to the system, you can use the terminal 15/54 to supply ancillary equipment like a dashboard. We remind you tu use a protection fuse of about 5 Amps. This is the most critical part of the job. You have to take care about the quality & stability of the connections. High voltage is present on these wire. We recommend that you protect with a a proper insulation tape all wires. 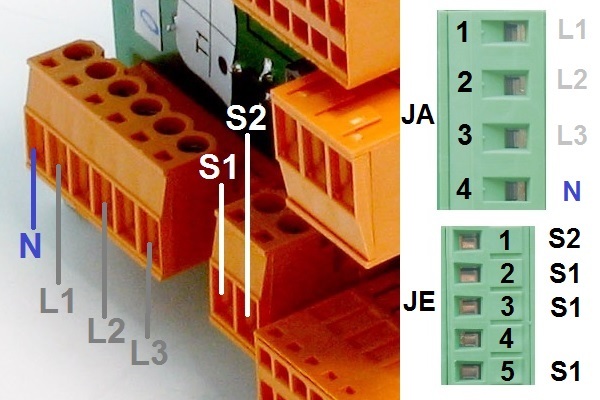 All wires must be properly secured in removable terminal blocks. The BE23 does not support a 3-phase generator connection. 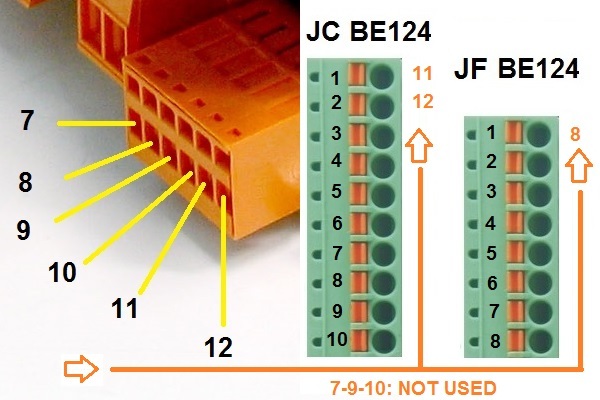 Be124 does not support a 3-phase connection with one CT only. For this reason, we recommend that you connect CT2 (terminal '2')-CT3 (terminal'3') to a common point (ground) terminal '5'. You will require to program the size of the current transformer (see section 11.3.13). Having on current transformer only you will not be able to get correct measurements of power. This is the last step of the connection procedure. Connect the D+/WL terminal '8' to JF1. The previous connections between '7' and '8' or '8' and '9' are no longer necessary when using Be124. You can cut the exceeding wires. Terminals '10', '11' and '12' are reserved for the pick up. In case you find wires on these terminals, connect the wire on terminal '11' to JC11. Connect the wire on terminal '12' to the terminal JC12. You can cut the shield. It is no longer necessary on the Be124. In case of instability of the RPM reading you can connect the shield to battery minus. When using a pick up, you are required to configure the teeth count (see [PICKUP/W RATIO] on the section 11.5.5 of the instructions manual).